It is very frustrating to try and photograph Anthophora plumipes males. These solitary bees fly very fast, with a characteristic high-pitched buzz, and briefly hover to inspect something, before darting to feed for a bit or to check some other clump of flowers, they rarely stop. A. plumipes, or the Hairy-Footed Flower Bee, are one of the first bees of spring. Males appear in mid March a few days before females, and the last individuals seen at the end of May. These bees are sexually dimorphic. Males are brown, large and furry, with middle legs bordered with long feathery flecks of hair (see possible purpose here). Females are a bit bigger than males, but jet black, with reddish pollen baskets. They look like a miniature all-black bumblebee. As bumblebees and honey bees, their ability to maintain a higher body temperatures than their surroundings allows them to fly early in the year: they are effectively 'warm blooded' insects. A. plumipes has a very long tongue and feed in deep flowers. 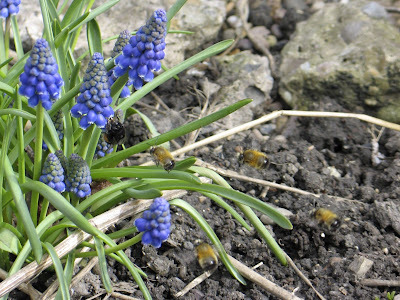 Today I saw the first male of the year, feeding on the first open flowers of Grape Hyacinth (Muscari) in the garden. 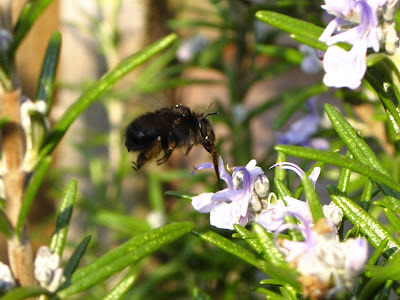 Later in the day, a couple of other males on Rosemary and Pulmonaria, which have also just started to bloom. Females spend more time feeding than males, hovering in front of the flowers and taking a little time to extend their huge tongue just before, so they are a bit easier to observe and photograph. With the female's appearance, the battle of the sexes begins. Males patrol their territories chasing males and checking flowers for females, even inspecting any passing black object. Males try to mate with feeding females, no preliminaries and no courtship, sometimes several males flying together squadron-like while checking females. Once mated, females start making waterproof cells in nearby walls or on the ground, laying eggs and provisioning them with nectar and pollen. But they also have to spend a lot of their time fending eager males off. A fascinating piece of research carried out by Graham Stone in Oxford showed that females harassed by males tend to feed in sheltered flowers to try and avoid them and this has a negative effect in their nectar provisioning, as these flowers take more time to reach. When the local males were removed, females changed their foraging to the outer flowers, when males were returned, females retreated to foraging in the shade. But the poor females are not only harassed by males, a species of cuckoo bee, Melecta albifrons, parasitises them, and they wait outside their nests until the females go foraging to lay their own eggs inside!